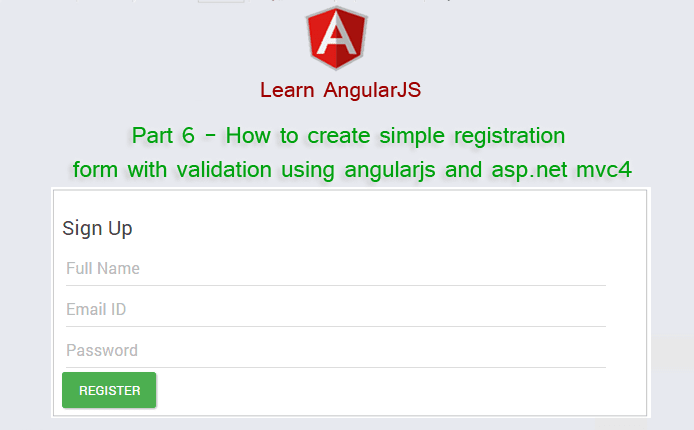 Part 6 - How to create simple registration form with validation using angularjs and asp.net mvc4. In this post, I would like to explain Part 6 - How to create simple registration form with validation using angularjs and asp.net mvc4. This is our 6th Post about AngularJS. Here I have explained a little about AngularJS and What we will learn in this section part by part. Here in this post I explained how can we create simple registration form with validation using angularjs and asp.net mvc4. As registration form is a very common form for Internet application, so I would like to create a simple registration form here to demonstrate validation and Save data to the database. Step-1: Create a table into the database. Here I have modified existing created table named User (created at Part 3 of this series). I have added 2 new fields here Email ID and Gender. Step-3: Add new action into your controller (here in the Data Controller) for Save Data to the Database. Step-4: Add Validation attribute to the model for Server side validation. Here I have created an angular controller named "Part6Controller" and a Factory named "LocationService" with $http injected service. I have explained a little about AngularJS controller here, about Factory here and about $http here. here you can see I have used $q, this is a angularjs service with help us to run asynchronous function and return result when processing done. We will see more about $q later. Step-6: Add new action into your controller (here in the HomeController) for Get the View for implement registration form. Right Click on Action Method (here right click on Part6 action) > Add View... > Enter View Name > Select View Engine (Razor) > Add.